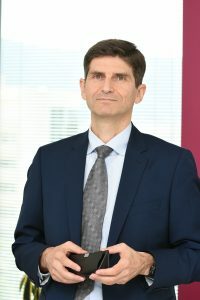 Oliver Rögl, CEO of Raiffeisenbank (Bulgaria), has been an expat in SEE for more than 20 years. In this interview with Discover CEE he gives insights in his life as an expat, what it is that makes Bulgaria special and how to make business in this country. You have been an expat in Bulgaria for nearly five years. How did that come about and do you now feel at home here? I have been an expat at Raiffeisen for more than 20 years – 3.5 years in Russia, 12.5 in Serbia and now Bulgaria. Back in 2013 the group needed to transform its bank in Bulgaria and I was offered to move 400 km in southeast. After more than twelve years in Serbia, I was ready for a change and Bulgaria seemed to be an attractive destination both from a professional and a private perspective. Moreover, moving from Serbia to Bulgaria was not a big transition – the markets to some extent are similar, the cultures, the history, the language. So, I can shortly answer your question – yes, I feel at home in Bulgaria and in SEE/EE as a whole. I have been living in the region for one-third of my life and working here during the largest part of my professional career. What is special about Bulgaria, in particular in terms of managing a bank? The largest banks in Bulgaria are owned by European banking groups, hence they do not differ from other banks in the EU in regard to good banking practices. What is special compared to some other countries in CEE is that the banking sector is not hindered by populist and political measures even during election campaigns and the financial crisis years ago. What makes Bulgaria a great place for business opportunities? The people. The working attitude in our banks in Bulgaria and Serbia is on a very high level. To be honest it is hard to differentiate the working attitude here in the region from that in Western Europe. Many Bulgarians tend to be very ambitious; they invest a lot in their education and are prepared to work hard for their career. Sometimes the tempo here is even faster than in Austria. On the other hand – the labor costs here are still comparatively low, despite the recent growth of the wages due to the positive economic development and the shortage of labor force. The tax environment in Bulgaria is also very favorable. Which industries flourish most in this market and for which do you see a high potential for the near future? The services have the largest share in the economic output – they count about ¾ of the country’s GDP. The banking sector is also very well developed and very competitive with 27 banks operating on the market. Traditional industries like pharmaceuticals, transport and the production of raw materials are well developed. Recently, the production of spare parts for the automobile industry is gaining momentum. I see a very big potential for the development of IT and outsourcing – it has tradition, the education in this sphere is good, the infrastructure, too. In the past ten to 20 years many international companies started their operations here. A lot of Bulgarian firms are competing quite well with them developing products and services for the whole world. The country also has a well-developed and very competitive fintech and start-up ecosystem. Bulgaria has been a member of the European Union since 2007. How optimistic are you about the euro adoption and what are your expectations for this adoption? The government announced that it will file Bulgaria’s application for the ERMII (the so-called single currency’s waiting room) by the end of June, using the momentum of the Bulgarian presidency of the European Council. Bulgaria has fulfilled the formal criteria for adopting the euro, but some countries have certain doubts, especially after the situation in Greece. However, I am optimistic, that in the coming years Bulgaria will join the eurozone. What needs to be considered if someone wants to do business in Bulgaria what needs to be considered? What is your advice to interested parties? The market is very competitive in almost all industries and if someone decides to do business in Bulgaria, they have to offer innovative products and services. The country suffers from a lack of labor force, but the people here are well educated and trained. I would also advice potential investors to start in sectors which are not so dependent on the state – like IT and outsourcing, for example, because there is still work to be done in the country in the fields of fighting corruption and reforming of the judicial system. Bulgaria is not your first assignment abroad. How does it differ from working in Serbia where you spent more than ten years? As I said, both countries have a lot of similarities in many aspects – cultural and professional. Regarding doing business, Bulgaria has the advantage that it is an EU member already, but I hope that Serbia will also join the union soon. What do you like most about Bulgaria, privately? Could you please give us an insider leisure tip? The country is beautiful, it has marvelous landscapes and mountains, which can be easily compared to the Alps. The weather is also very pleasant – the summer is green and sunny and in the winter it is snowy. I would advise people to visit the old towns like Plovdiv and Kotel – there one can find preserved architecture, mountain views and great cuisine. The Rhodope Mountains are also a must-see – there you can travel back in time to explore the history and culture of past centuries and see magnificent nature views as well. What do you miss about your home country Austria? The friends and the family. This is one of the disadvantages of working abroad. However, telephones, new technologies and easily organized flights help us to stay in touch. Prev:Euro area and/or “Banking Union”: Bulgaria and other SEE countries ante portas? It is people like Mr. Rögl that this region, and in fact any country, needs. People who are open-minded and transfer knowledge accumulated in one country to the next. Regarding the blog as a whole: well done, guys, I like the info-mix offered!